Miriam Rose Brooker is a feminist researcher in the final year of study towards her PhD degree at Edith Cowan University (Perth, Western Australia). Miriam is investigating how women cope with abortion, using qualitative research methods and an art process to distil the healing wisdom of women post abortion. Based on my feminist position of valuing the diversity of women’s experiences, I sought to provide my participants with multiple options and a unique way of accessing and expressing their own perspectives through the research process. In designing my project I set out to provide open-ended questions and processes that allowed a woman’s abortion experience to be explored and expressed in ways that were engaging and meaningful to her (Sprague, 2005; Wilkinson, 2000). In doing so I rejected the narrow view of abortion represented by the pro- versus anti- abortion debate and conventional psychological literature on the impacts of abortion. The methods that I used were designed to provide a space that may not have been experienced by the individual women in their day-to-day lives. That is, I aimed to provide a confidential, interested, attentive and non-judging space where a woman could explore the events that happened around her abortion(s) and how she responded to them. The questions asked and the art-based process offered my participants an opportunity to identify, express and review any conclusions that they may have previously reached about themselves and their lives in relation to their abortion experiences. As a feminist, I adopted a post-structuralist approach to identity and subjectivity because this allowed me to take a broad approach to how a woman might make sense of her own abortion experience or context. I was inspired by the rhizomatic ideas of Gilles Deleuze and Félix Guattari which imply the complex, multi-faceted, interactive, and exploratory nature of subjectivity (Deleuze & Guattari, 1987). Rather than viewing the self as fixed or determinable, Deleuze and Guattari’s work encourages an approach to humankind which allows that subjectivity transforms, morphs, interacts and changes shape in response to the varying contexts and situations which are encountered by individuals ongoingly. Deleuze and Guattari’s view of identity challenges narrow psychological views of the self that predict, categorise, and limit (Deleuze & Guattari, 1987). Such approaches to identity constrain not only the way that research on the self is conducted, but also the experiences of self that participants will likely have through participation in this kind of research. The approach that I took in my project afforded my participants space for exploration and self-discovery of their own subjectivities. Your situation and you are not two things, as if the external things were a situation without you. Nor is your bodily sense separate from the situation and merely internal…The body-sense is the situation, inherently an interaction, not a mix of two things (Gendlin, 1992, pp. 343-353). The therapist calls the client's attention to an as yet unclear partly cognitive and situational complex which is concretely felt by the client. The client must then be willing and able to focus his [sic] attention directly on this felt complex so that he [sic] can concretely feel and struggle with it (Gendlin, Beebe, Cassens, Klein, & Oberlander, 1968, p. 218). We sense what next move is stultifying, too comfortable, guiltily avoidant…We know when we have woven a thin bridge of superficial logic over a problem that still remains (Gendlin, 1992, pp. 343-353). In this way, change that occurs through Focusing is quite specific to an individual’s life situation, but it also contains great creative potential for them (Cornell, 2013). There is an important difference between what Gendlin has identified as Focusing and the practice of simply talking and reflecting content back to a client, which does not tend to lead to effective psychotherapeutic change. Simply talking may include both internal cognitive explanations and descriptions of external situations or events, which Gendlin identified as ‘externalising’ and ‘intellectualising’ (Gendlin et al., 1968). However, Focusing within a therapeutic context takes this a step further by drawing a client’s attention to their felt sensing or felt meaning. In this mode, the therapist’s task is to draw their client’s attention to the felt meaning by offering a “reflection of feeling…” whereby “…the therapist will respond to the feelings the client implied” (Gendlin et al., 1968, p. 217). This assists the client to focus their attention on their own felt meaning, which is associated with effective therapeutic change. Ann Weiser Cornell, a former student of Gendlin’s and a teacher and developer of Focusing practice in her own right, describes Focusing as a way of “…understanding and facilitating what some human beings naturally do—and all have the capacity to do—when up against the need for change” (Cornell, 2013, p. 6). Focusing as a term incorporates both attending to this naturally occurring felt sense and the processes that can be taught to help people bring their awareness there (Cornell, 1996; Gendlin, 1981). Focusing can be applied in situations outside of therapy such as creativity and problem solving, and is a useful addition for any activity intended to develop us personally or deepen our bodily awareness or knowing (Cornell, 2005; Gendlin, 1981; Gendlin et al., 1968; Rappaport, 2009). Focusing, its practice and the community of Focusers has vastly grown since Gendlin identified and named it during the 1960s. Focusing is employed by a broad range of practitioners in contexts such as psychotherapy, counselling, creativity, spirituality, and community wellness (Cornell, 2013). Focusing practice continues to develop and evolve as it integrates other associated psychotherapeutic approaches and practices including “…mindfulness, somatic orientation, the present moment, relationality, the importance of acceptance and empathy, and the insights from attachment theory and self-regulation” (Cornell, 2013, p. xxi). Focusing is not a full or complete therapeutic modality in its own right, but it is an effective way of engaging with therapeutic change, hence it complements a range of broader therapeutic frameworks (Cornell, 2013). According to Gendlin, Focusing enhances every other therapeutic method, “…by letting them work as they intended” (Gendlin, 1991, p. 264). Ann Weiser Cornell and Barbara McGavin (certified Focusing teachers) co-collaborated on the elaboration and further development of the practice of Focusing, into a related but distinct method which is called ‘Inner Relationship Focusing’ (Cornell & McGavin, 2002). Inner Relationship Focusing guides people to be friendly rather than reactive in relation to what emerges during a Focusing session, via ‘presence language’, which helps Focusers to disidentify from their inner experiences, while still keeping them company (Cornell, 2013). The Inner Relationship method of Focusing is very compatible with my feminist stance in relation to this research project, because of its non-intrusive and supportive approach to strengthening a Focuser’s inner experiencing. Cornell and McGavin teach Focusing as a partnership between two people who exchange sessions of equal length, and take turns in the role of Focuser or Companion. The Companion’s role is largely to keep the Focuser company, by simply being present and reflecting back what the Focuser has said in specific ways. According to Gendlin (1990) as well as Cornell and McGavin (2002), this simple presence is the key to being helpful since, “What matters is to be a human being with another human being” (Gendlin, 1990, p. 205). In my role as a researcher offering Focusing-based sessions with women who have had no prior experience of Focusing, I adopted the role of Guide, which involves showing someone how to Focus through the use of gentle reflections and suggestions during the session, in response to the Focuser’s own inner sensing. Cornell (2005) describes Guiding as “…an intuitive process,” (p. 31) and one where no advice is given, and nothing other than reflection is offered in response to what the Focuser is saying about their sense of their inner experience. To me, this is a very respectful and non-intrusive stance to adopt towards one’s research participants, whilst also supporting them to stay present to whatever emerges for them during the session. I view Inner Relationship Focusing practice as a way of helping me to be supportive and minimising my influence so that my participant’s bodily perspectives on abortion might be heard in their own right. Not being trained as a psychotherapist, I found that obtaining Inner Relationship Focusing training was timely, accessible and affordable for me given the limits of my PhD project timeline/budget and my methodological aspirations. Inner Relationship Focusing training was readily available to me by telephone within Australia (Jo Kennedy, Focusing Australia, Melbourne) and internationally with Ann Weiser Cornell (Focusing Resources, California). I completed four levels of Inner Relationship Focusing training (75 hours) during the first eighteen months of my research project and achieved a certificate of Proficiency as a Focusing Partner (The Focusing Institute, New York) before conducting Stage Two of my research. I have also practiced my Focusing skills with my ongoing Focusing partner on a weekly basis since beginning Focusing training, and continue to do so beyond the completion of my research activities. In addition to training as a Focuser, I also found a link between Focusing and artistic expression, which opened up the possibility of my participants expressing their bodily and subjective experiences of abortion in a non-verbal, visual, and creative way. Laury Rappaport (2009), an expressive art therapist and certified Focusing trainer and coordinator, has documented a method incorporating both Focusing and Art Therapy, which she calls Focusing-Oriented Art Therapy. Rappaport’s book provided me with expert guidance regarding the possible structure of my research-based sessions as well as identifying some of the key resources and instructions required to support my participants’ artistic expression effectively. Within her book Rappaport emphasised the difference between engaging with art as a creative expression and art as therapy (which requires a professionally trained therapist), and encouraged the use of art “…as a creative expression that is basic to our humanness—while seeing that art therapy as a profession encompasses much more than creative expression” (Rappaport, 2009, p. 72). My engagement with art as a form of creative expression was designed to give my participants another way of communicating their felt sense experiences during their Focusing sessions. Artistic expression opened up a way for them to depict their felt senses (which often included images, textures, shapes and colours) in a way that went beyond the limits of language, which can never adequately capture the complexity of a person’s bodily felt sensing. In keeping with a view of art as creative expression, I made no attempt to interpret what my participants produced in their art making. Instead, I engaged with feminist principles of art therapy, which privilege women’s realities, incorporate an acceptance of ambiguity, a respect for the expertise of the participant, a commitment to accompanying her process during the session, and a collaborative approach to exploring her art work and its meaning (Halifax, 2003). Accordingly, I invited each woman to describe what she had created and what it meant to her at the end of each art session. This way of proceeding was entirely consistent with Focusing, which also gives way to the Focuser’s sense of direction and their insights within the session. By combining Focusing and artistic expression my research is able to provide snapshots of some of the dynamic insights that can emerge when women are given the space and the invitation to explore and express their own experiences of abortion in a supportive and non-intrusive context. The knowledge resulting from this combination is both verbal and non-verbal and I’m particularly excited by the potential of an arts-based process to communicate something subtle and implicit to viewers/readers of the work. It is my hope that a woman might view my participant’s artwork and feel something inside herself respond to it, regardless of any words that might accompany the image. This possibility impressed me as being an implicit yet direct communication from one woman’s bodily knowing to another’s, however that might be received or engaged with. My research is qualitative and employs a combination of two main methods (semi-structured interviews and Focusing and artistic expression sessions), used one after the other, to obtain diverse information about women’s experiences of abortion. One of my key reasons for employing two quite distinct methods was to enhance understandings about abortion by obtaining layers of information (Leckenby & Hesse-Biber, 2007; Reinharz, 1992). One layer of information contained the verbal accounts of women’s abortion experiences given during individual semi-structured interviews. The other layer included the verbal reflections and the visual artistic expressions of women’s bodily perceptions of their abortion experiences, given during individual Focusing and art sessions. I also conducted the research in two stages so that the second stage might provide different and perhaps previously unrecognised or unexpressed insights to those identified in the first stage of the research. This intention reflects what Barbara DuBois (1983) refers to as women’s ‘double-consciousness.’ This term expresses the notion that women can function in society and have an awareness of society’s standards and discourses, and they can also obtain access to their own perceptions and experiences (DuBois, 1983; Leckenby & Hesse-Biber, 2007). DuBois describes this second and sometimes vague or submerged kind of knowing most eloquently when she states, “…we are aware that this reality has often been not only unnamed but unnameable” (pp. 109-110). The second stage of my research was designed to privilege women’s bodily knowing and perspectives on their abortion experiences in a way that simply telling the story of their abortion might not. This stage also provided a particularly supportive and attentive space so that this unnamed knowing might be accessed and experienced by participants. Within Stage One of the research I provided my participants with a range of response options to choose between, from anonymity to direct personal contact with me, as each woman preferred. My research process was developed to ask the same questions but through their choice of an anonymous online survey, an online or hard-copy journal and a face-to-face or telephone interview. Of a total of 23 participants who had experienced abortion, 14 chose the face-to-face interview, five chose the anonymous online survey, three chose the telephone interview (participants from other States within Australia), and one chose the online journal option. Overall, the majority of women who attended a face-to-face interview had met me previously on at least one occasion (10 participants), whereas four women attended without having met me prior to the interview. What was the time after the abortion like for you? (Prompts: How did you cope? You might want to include any significant markers, turning points or insights that you are aware of in relation to this abortion. Did you create or hold a ritual or ceremony post abortion?). For women who had experienced multiple abortions, these kinds of questions were repeated during interview for each procedure. I found that the same woman could report quite different experiences and responses for each abortion. For example, one of my research participants, Kristie, saw her first abortion as a way of severing ongoing ties with a violent man that she didn’t want in her life or the life of her child. She chose to abort the second pregnancy despite wanting to have the baby and an ongoing relationship with the father. I was living with my boyfriend in Broome, he was a horrible, controlling, violent person and we broke up and then I found out that I was pregnant to him (Kristie’s interview transcript, p.1). I was choosing life without violence… and I just knew that he was not father material, genetically or in personality and values.” (Kristie’s interview transcript, p. 5). …I had just gone 21 and I found out that I was pregnant to… [an] Amazing bloke, [a] really great bloke, but just when I found out…I was pregnant to him his previous girlfriend turned up fat bellied, about to drop his baby (Kristie’s interview transcript, p. 6). I wasn’t madly in love with him but we had the history so that we did love each other, but it was just really crushing to know that I was making this decision for them, not for me (Kristie’s interview transcript, p. 7). I particularly valued the kinds of responses that I received from women who took part in the face-to-face semi-structured interview process because the research data generated was broader and richer than any other method employed within Stage One of the study (including telephone interviews). There was more space for me to respond and to be supportive, and for each participant to respond in turn, and the deeper listening and sharing that occurred within this exchange left me with a stronger sense of rapport and insight into each woman’s experiences. There were some very brave and helpful contributions made from women who shared their abortion experiences through the other participant options, but they tended to be more condensed and less expansive about the personal meaning and significance of the events and circumstances reported. These participants didn’t have the benefit of an interested, supportive, responsive and physically present listener. The rapport that was generated through the face-to-face interviews may be explained by the strengths of feminist in-depth interviewing generally. These include an emphasis on a conversational style where the researcher is responsive to the cues of the participant when posing questions (Hesse-Biber, 2007) and providing a forum where more feeling for one’s participants can be conveyed (Westmarland, 2001). Focusing and art afforded me a way of gaining access to my participant’s bodily-felt perspectives on abortion through an individual semi-structured session with eight of my face-to-face interview participants. The sessions were held in a variety of places and this was determined by what was most convenient to my participants geographically. One session was held in the country at the weekend home of my participant, two were held in participant’s private residences, two were held in a hired art office/studio space in Fremantle, one was held in a hired council meeting room, one was held in a park, and one was held in my private practice therapy space at home. Based on the range of materials suggested by Rappaport (2009) I gathered together clay and clay-work tools, acrylic and water-based paints and brushes, pastels, feathers, beads, lace, wool, buttons, shells, twigs, nuts, felt, tissue paper and a range of paper options of different colours and carried them with me to each session in a large laundry basket. I pre-prepared participants for the art-making part of the session by letting them know that they could choose materials to work with that would help them to express their felt sense (Rappaport, 2009). I showed participants through the range of materials available before each session began so that they knew what was available to them. Rappaport’s Focusing-oriented art therapy book (2009) served as a useful guide which showed how Focusing and art might be combined in a single session. I adjusted the Focusing components of Rappaport’s structure to include the Inner Relationship Focusing method, which involves four stages: coming in (bringing awareness into your body); making contact (with something inside); deepening contact (keeping something company); and coming out (bringing the session to a close) (Cornell & McGavin, 2002, p. 6). By integrating Inner Relationship Focusing into Rappaport’s structure I was able to offer my participants sessions with the following format: a body centred attunement (coming in); a Focusing conversation (making contact and deepening contact); an art activity; and a Dialogue or period of reflection with reference to the felt sense (Rappaport, 2009). I also included a review of the process in this final stage of the session. Let your awareness rest gently in that whole middle area. And give yourself a gentle invitation in there like you’re saying, ‘What would like to come and be known about my abortion experience?’ And then wait…and when you’re aware of something you might let me know. Each participant took time to notice what came up in her being in response to the above invitation, and when ready, would describe what she was present to. When a woman shared what she was noticing, I would reflect this back to her using her words as much as possible, and using language like, “You’re sensing…,” and “Something in you…” since this kind of language helps to encourage the Focuser to stay present to their own inner experiencing (Cornell & McGavin, 2002, p. 63). As the session progressed and the participant developed a stronger relationship with her felt sense, the responses become something like, “Its letting you know…” (Cornell & McGavin, 2002, p. 65) so that the closer experiencing was mirrored and supported. I made one notable departure from my Inner Relationship Focusing training within the research context. If a woman was silent for a long period of time, I would check in with her by asking something like, “And if it feels okay to, maybe you could let me know what you’re aware of now,” or “…maybe you could let me know what’s happening in your body now.” This kind of prompt would not usually be offered in a Focusing session because it could draw a Focuser’s attention to the relationship with their listener, rather than attending to what is happening inside them. However, it allowed me to check that my participants were going okay in the session, and allowed me to provide additional support if this was needed. I found that participants responded well to these invitations and were forthcoming about what they were experiencing at the time. What transpired in the sessions can be described as a co-collaboration since factors such as my guiding suggestions, my body language and my tone of voice probably helped to shape the session in a particularly supportive way. However, I also verbally acknowledged and supported any indication that a participant made about her preferred direction(s) during the session. It was part of my Focusing training never to advise or steer a Focuser and always to give way to the direction that they chose during the session. In addition, I had no expectation of a ‘common’ abortion experience or response. The earlier interview process had already confirmed for me that even if the backgrounds of women were similar (e.g., Christian religious upbringing), the ways that they responded to their abortion(s) and the meanings that they ascribed to their experiences were often very different. The Focusing and art sessions were respectful of this diversity as they were open-ended and they provided a lot of space for women to take things in any direction that seemed relevant to them (given the invitation that I posed), even if the relationship between what was emerging during the session and their abortion experience(s) was not apparent for some time. Renée: I don’t know if it’s because I’m concentrating on…that it is, this is about the abortion experience. I’m seeing it’s like little green, I guess they’re almost how I picture an embryo, like a little pea-nutty shape going into the jellyfish and then just floating off. Miriam: Yeah it’s like it’s showing you a little peanut shape going into the jellyfish and just floating off, or something. And there’s a wondering there if it’s in relation to the abortion experience. (Pause). And maybe see if it would be okay to keep that company awhile. Renée: [Long pause]. And now I see the shapes of, like these birds, the green and the purple on top of them, and again it’s almost like floating-flying, it’s just, it’s very quiet. Miriam: Yeah, you’re noticing that it’s showing you something like birds of green and purple and they’re almost like floating-flying, and there’s something really quiet about it. And you might sense what mood it’s in, or if it has its own emotion. Renée: Peace (Renée’s art session, p. 2). Renée: [Pause]. I get the feeling now that I’m back down at the bottom where I was going before and I was looking up, I was going down under the water and trying to look up but I couldn’t see and now it’s like I’m sitting, it’s almost like a little crater, and there’s black, like I can see the edges and its almost from the crater is coming out all these little, almost white luminous and they’re the jellyfish, that’s where they’re coming from. And that’s where it comes back in and goes back out. It’s really quite nice…It’s as if it’s at the bottom of the ocean and that’s where the crater sits, and that’s the most beautiful blue above it. It’s almost like a royal/midnight blue and that’s where the start of everything comes, the jellyfish start there. It almost feels like everything comes back down into the ocean, the bird that was the moon and everything just ends up back there and then it starts again and that’s how it starts again (Renée’s art session, p. 3). Renée gave the name ‘Universality: the universality of nature and souls” to the scene that she was sensing inside her body during her session. Renée: …it’s still a part of it, it’s a wave that’s part of the ocean. It’s unnatural on the one hand, but it’s still okay, I guess that’s my view I guess, it’s funny, I never…that’s so weird that that’s how it came out because that is kind of my view with how I see things now and maybe terminating a pregnancy is not how nature necessarily intended it but nature does it too, you know, nature returns the souls or nature ends it when people don’t want it to end [Miriam: Hmmm] so maybe that wave, it could be me terminating my pregnancy, it could be nature terminating a pregnancy if someone doesn’t want to terminate and they want a child but it doesn’t happen for them. It’s a freak wave but it’s still part of the order. Miriam: So you’re sensing something quite freakish about that wave, whichever way it goes, but that it’s returning it to the order, the natural order, or something like that [Renée: Hmmm]. And whether someone is terminating a pregnancy or whether nature is terminating that pregnancy there’s something quite natural about it. Renée: Hmmm, yep. Nature can be ruthless I guess, sometimes people have to be ruthless, if that’s the way you consider abortion, there is ruthlessness to it, there is a selfishness to it because you’re the one that has to deal with it, but for whatever reason you have to, it’s just nature, people are as natural as, animals reject their young, people can reject, nature is nature and people are a part of it. Oh maybe that’s the person on the boat, maybe that’s where I’m thinking maybe you don’t want to be a part of it, the oar’s in, he doesn’t really (or she), you don’t really want to be in it, but you are (Renée’s Focusing and art session transcript, p. 5). Although the links between the scene that Renée was describing and her understandings about abortion were not apparent during her Focusing session, these became clearer to her as she reflected on her artwork and her session with me. During her review of the session she reflected, “It was quite amazing that your body can, mind, body, does that in the interpretation and can come up with something to explain your mind in such a visual way, or explain your feelings, it’s yeah, very cool” (Renée’s Focusing and art session, p. 6). At a stage in the session where I felt that a participant had made contact with a felt sense, I would offer a further invitation to her which could potentially form a bridge into the art-making activity: And if it feels right, maybe you could invite an image or a symbol or a word that connects to that felt sense that you have there to come and be known (Based on Rappaport, 2009, finding a handle/symbol, p. 106). The woman herself would often determine when she was ready to move into making the art, by saying something like, ‘I know what I want to make now.’ If this occurred she would generally open her eyes and I would then assist her with getting whatever materials she wanted. Some women kept on Focusing after this invitation was given and I would keep following them as Guide until they said they were ready to make some art, or the Focusing reached a natural conclusion. For those participants who remained deeply inside the Focusing experience I offered verbal guidance as for the Coming Out part of an Inner Relationship Focusing session. This involved bringing awareness back to the body and the room gently and gradually. During the transition between the Focusing and the art-making activity I invited my participants to limit conversation with me and to stay in touch with their felt sense. Participants indicated what they wanted to work with and I got all of the tools and materials that they required and put them within reach. I sat quietly while my participants worked and offered technical support or advice if requested. Three women worked primarily with water colours; two worked with clay and decorative materials such as shells, nuts, beads and feathers; one worked with acrylic paint and glitter; one worked with chalk pastels; and one worked with both watercolours and felt, in what became a 3-D piece. After participants let me know that they had finished working on their art-work, I invited them to place it so that we could both view it (Rappaport, 2009). I then gave participants the following invitation, “So maybe you could in your own words describe what you have there,” or “So how would you describe it now that it’s on the page?” Participants described both what they had made and what it meant to them, and I used Focusing-like reflections whenever this seemed helpful or timely. At a stage in the conversation where it seemed appropriate, I would ask participants, “If you were to give this piece a name or a title, what would it be?” (Rappaport, 2009). After the Dialogue stage of the session was complete I asked participants if it was alright with them if I asked them three brief review questions about the process itself: (1) How did you feel about the process in the time leading up to it? ; (2) How did you feel about the process itself, what was it like for you? ; and (3) How do you feel now that you’ve completed the process? At the conclusion of the sessions, I took a photograph of the participant’s artwork, which I sent to them as a record of the session if they wanted this (or they took their own photo). I then kept the artwork so that I could either scan it onto my computer hard-drive or get it professionally photographed (for 3-D and bulky items). After the art-work was recorded digitally I returned it to participants personally or by registered mail. Um, obviously I was about to cancel. I felt like it would probably be complicated or something, which obviously it hasn’t been. Or just that I’d stumble across stuff that might be difficult or blah-blah-blah, but that’s not what I ended up stumbling across (Erin’s art session, p. 4). … I was kind of a little bit like going, ‘Jeez you know, I wonder, am I supposed to be having something more?’ Like more of a message or seeing something other than just feeling really nice just to be laying down for a while and seeing yellow [Miriam: Hmmm hmmm]. 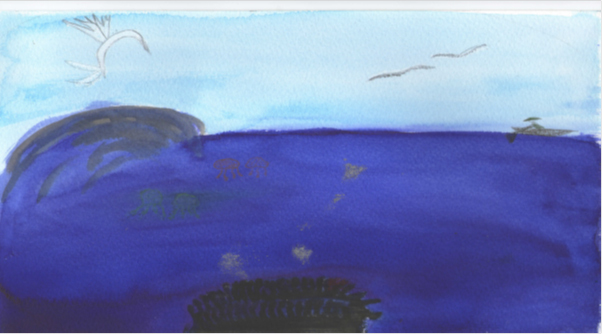 So that, at the same time, I was really happy and joyous so that was really beautiful (Erin’s art session, p 4). Well clearly it took me from being in a stressed situation or frame of mind that was completely busy on other stuff and brought me back into my body and walked me through…and then I put the perspective using your prompts etcetera around my inside world if you like, the abortion and what was going on inside, because I’d never ever really contemplated my abortion from the perspective of my body…actually doing the art work I felt really energised and really focused and really in-tune with what I was feeling (Nicola’s art session, p.9). Melanie: [Long pause]. It’s sort of like a breeze, or I can’t explain it. Miriam: Hmmm. You’re sensing something like a breeze there. Miriam: And there’s a sense of leaving with that breeze. Melanie: And it makes me sad. Miriam: Hmmm, something about that breeze leaving brings a feeling of sadness. And maybe just see if it would be okay to be with that. Miriam: And if it feels right, you might invite it to let you know what gets it so sad. Melanie: I don’t know if this is me or [Melanie laughs], or what I’m feeling, just that it wasn’t the right time. Miriam: And maybe just take some time to sense if there might be more it wants you to know. Melanie: I keep seeing the colour yellow [Melanie laughs nervously]. Miriam: Yeah, so you’re really seeing, it’s really showing you something very yellow. And maybe take that word yellow back to that sense in your body and see if that describes it well. Miriam: And if it feels right you might like to sense what kind of contact it would like from you right now. Melanie: I just feel like it wanted to be acknowledged. Miriam: Yeah, there’s an awareness there that it just wanted to be acknowledged. Miriam: And if it feels right you might invite it to let you know what it’s wanting for you. Melanie: I feel like it’s okay. And that that’s what it was wanting, you know, that everything’s okay (Melanie’s art session, pp. 2-3). I feel good. I feel tired actually. Um, but you know, okay, good. I don’t feel depressed or anxious or anything like that, I just feel quite exhausted, I feel emotionally exhausted actually. [Me: Yeah, yeah]. I feel like I’ve been through, you know, something (Melanie’s art session, p. 15). Great! I’m very happy with what I’ve done. I didn’t think I would be capable of that kind of expression, I was worried about being arty and creative because I’m not, but knowing that I have that in me and being able to project it, I think there is a creative side in everyone…it’s nice to be able to bring it out [hmmm] (Renée’s art session, pp. 6-7). Overall, my Focusing and art session participants accessed a broader sense of their own experience of abortion through the sessions. Multi-dimensional layers of experience were accessed and interwoven, including bodily, emotional, social, cognitive, and spiritual aspects. The artistic expression component of each session gave these participants the opportunity to express, reflect upon, and ground a felt sense of their whole abortion experience that they had accessed during the Focusing conversation. The artwork produced was a visual reminder of the session and of the felt sense that inspired it, and each woman was able to keep that for herself. It was really gratifying for me to witness the discoveries that each woman made, on so many levels, through their participation in this process. It seemed like a bonus that the women all found some affirmation, reassurance, insight, joy or peace through the experiences that they had in their session. As a research strategy, this method and its associated methodology allowed me to investigate some overlapping areas of interest to me, including research as a supportive and potentially therapeutic endeavour, and feminist research which offers the potential for women to engage in self-directed exploration and expansion into fresh subjectivities. Bringing together Inner Relationship Focusing and artistic expression allowed my qualitative research framework to stretch beyond voiced and storied in-depth interviews into the subtle and implicit realm of bodily subjectivity. Focusing and artistic expression provided structures which invited women to explore and engage with a broader sense of their abortion experiences, somewhat beyond the constraint of social and spoken conventions. This method has therapeutic potential and would also be usefully employed as a healing process with women who want to explore their past abortion experiences further in a gentle and supportive way. It privileges women’s bodily inner knowing, which can readily get lost or overlooked in the constraining context of social stigma and controversy that often surrounds abortion. Once accessed, this kind of self-authoritative inner knowing can reshape or extend a previously limiting or unsettling experience of abortion into something more dynamic and self-affirming. The inclusion of visual art allows the inner felt sense to interact symbolically and directly with the woman herself, without any spoken input or guiding from the facilitator or therapist. She then has the opportunity to express her insights and discoveries freshly. Through this method I have demonstrated that my participants had an implicit sense of their whole abortion experience, which once accessed, was personally informative, emotionally supportive, and meaningful to them. I am left in no doubt that offering the Focusing and art process has enriched and extended the knowledge generated through my research activities and processes. A fuller account of the findings generated through this Focusing and art process will be provided in a later paper. Cornell, A. W. (1996). The power of focusing: A practical guide to emotional self-healing. Oakland, CA: New Harbinger Publications. Cornell, A. W. (2005). The radical acceptance of everything: Living a focusing life. Berkeley, CA: Calluna Press. Cornell, A. W. (2013). Focusing in clinical practice: The essence of change. New York: W.W. Norton & Company. Cornell, A. W., & McGavin, B. (2002). The Focusing Student's and Companion's Manual (Part One & Part Two). Berkeley, CA: Calluna Press. DuBois, B. (1983). Passionate Scholarship: Notes on values, knowing and method in feminist social sciences. In G. Bowles & R. Duelli-Klein (Eds. ), Theories of women's studies (pp. 105-117). Routledge & Kegan Paul: London. Gendlin, E. T. (1962). Experiencing and the creation of meaning: A philosophical and psychological approach to the subjective. Evanston, IL: Northwestern University Press. Gendlin, E.T. (1964). A theory of personality change. In P. Worchel & D. Byrne (Eds. ), Personality change (pp. 100-148). New York: John Wiley & Sons. Gendlin, E. T. (1981). Focusing. New York: Bantam Dell. Gendlin, E. T. (1990). The small steps of the therapy process: How they come and how to help them come. In G. Lietaer, J. Rombauts & R. Van Balen (Eds. ), Client-centered and experiential psychotherapy in the nineties (pp. 205-224). Leaven: Leaven University Press. Gendlin, E. T. (1992). The primacy of the body, not the primacy of perception (Excerpt from pages 343-353, slightly revised). Man and World, 25 (3-4), 341-353. Halifax, N. (2003). Feminist art therapy: Contributions from feminist theory and contemporary art practice. In S. Hogan (Ed. ), Gender issues in art therapy (pp. 31-45). London: Jennifer Kingsley Publishers. Hesse-Biber, S. N. (2007). The practice of feminist in-depth interviewing. In S. N. Hesse-Biber & P. L. Leavy (Eds. ), Feminist research practice (pp. 110-149). Thousand Oaks, CA, USA: Sage Publications. Kumara, A., Hessinia, L., & Mitchell, E. M. (2009). Conceptualising abortion stigma. Culture, Health & Sexuality, 11(6), 625-639. Leckenby, D., & Hesse-Biber, S. N. (2007). Feminist approaches to mixed-methods research. In S. N. Hesse-Biber & P. L. Leavy (Eds. ), Feminist research practice (pp. 249-292). Thousand Oaks, CA, USA: Sage Publications. Rappaport, L. (2009). Focusing-oriented art therapy: Accessing the body's wisdom and creative intelligence. London: Jessica Kingsley Publishers. Sprague, J. (2005). Feminist methodologies for critical researchers: Bridging differences. Walnut Creek, CA: AltaMira Press. Sullivan, S. (2001). Living across and through skins: Transactional bodies, pragmatism and feminism. Indiana: Indiana University Press. Westmarland, N. (2001). The quantitative/qualitative debate and feminist research: A subjective view of objectivity. Forum: Qualitative Social Research, 2(1), 28. Wilkinson, S. (2000). Feminist research traditions in health psychology: Breast cancer research. Journal of Health Psychology, 5(3), 359-372.